Editor’s note: Well, it’s been a year since this one was first published. And while a lot has changed over the last 12 months, a few things remain the same. I keep getting older, like a kid on Christmas morning I still look forward to even-numbered days, and I still love a strap change. Most importantly, though, the LHD is still on my wrist and it looks and feels as good today as it did when I first picked it up. Late last year I celebrated a milestone birthday, turning the big three-zero. After coming to terms with the death of my twenties and realising that the big moments in life should be celebrated not mourned, I decided the occasion needed to be marked with a new watch. Thankfully, my wife agreed, so a budget was set and the search was on: I began the task of shortlisting contenders. The top pick changed more times than I feel comfortable admitting, but finally, one watch prevailed — the practical and modern Tudor Pelagos. The only thing left to decide was the dial colour. 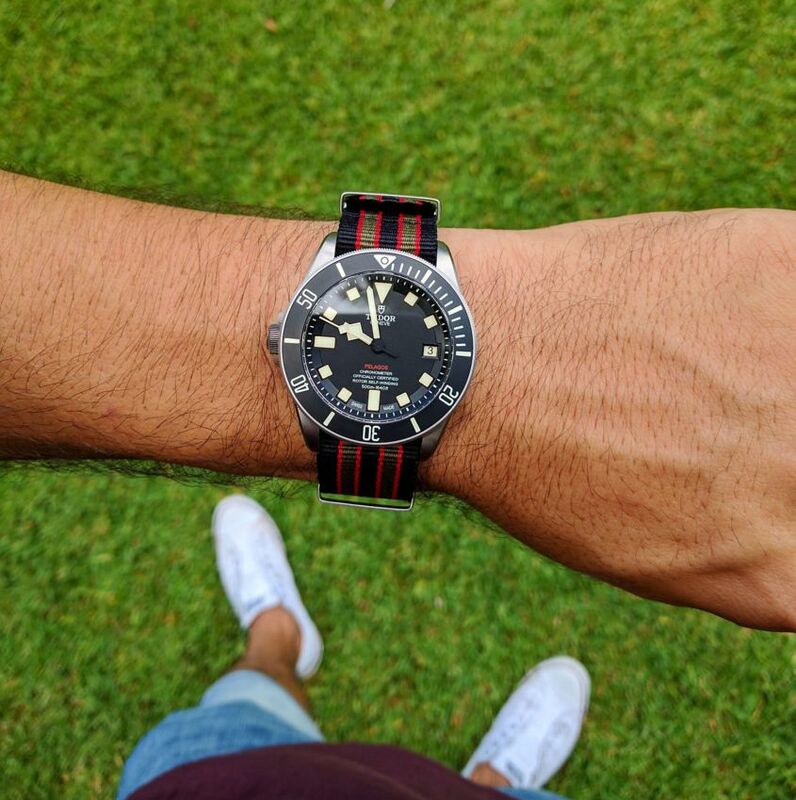 The easily wearable black dial? Or the vibrant blue? 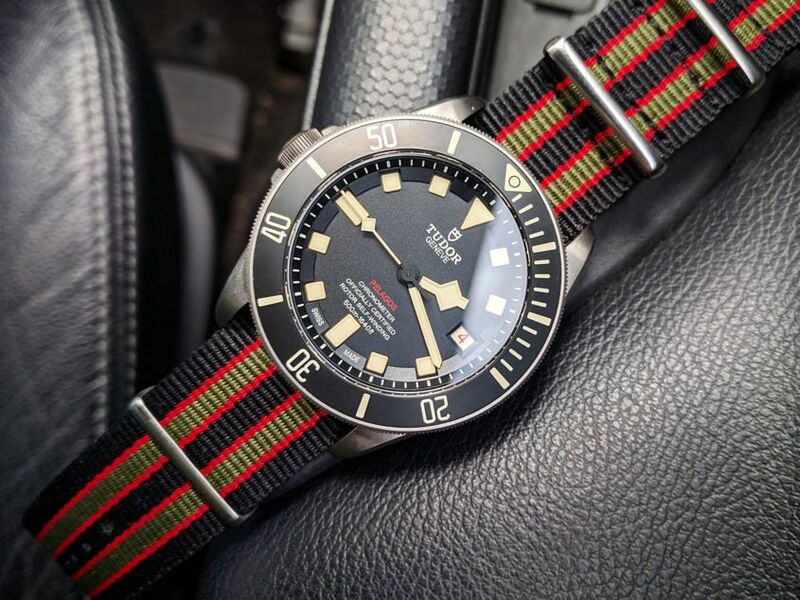 Then, to throw a spanner in the works, the week I was ready to walk into the local dealer and make my pick with the toss of a coin, Tudor surprised us all with the release of the southpaw-approved Pelagos LHD. Call it luck … call it fate … call it whatever you want, but as soon as I laid eyes on the LHD, the choice was clear, and after a couple of phone calls, one was on its way to me. My first impression was … flabbergasted! In the best possible way. The amount of innovation and sheer quality packed into the LHD is unequalled by any other brand at this price – a superbly finished satin-brushed titanium case, 500m WR with a helium escape valve, lume-injected ceramic bezel, titanium bracelet with an amazing auto-expansion clasp, and just to top it off, a chronometer certified in-house movement with a 70-hour power reserve. 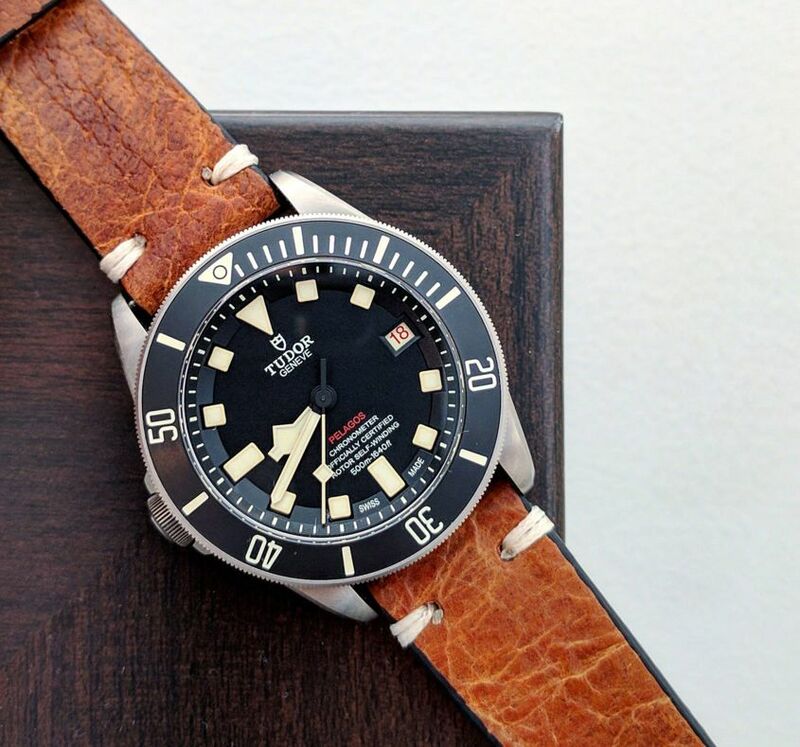 I’d long admired Tudor and now to finally have one to call my own, I just couldn’t be happier. Once I put it on, it felt … familiar. There’s something about the dial and its milky coffee lume. It adds a certain warmth and soul that you don’t get with the other versions. 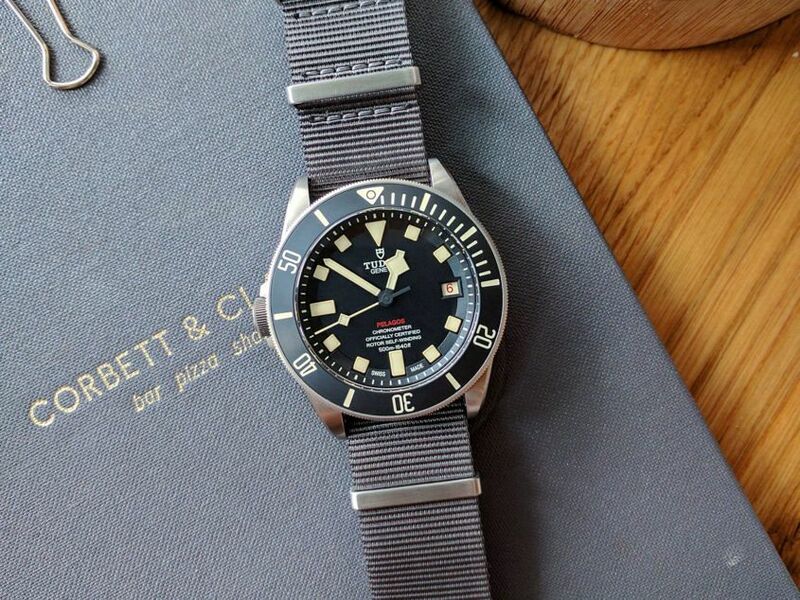 Pair that with the warmth of the titanium case and the LHD felt like it had been on my wrist for years and years. I will admit that at first I did have some hesitations about the left-hand crown. I wear my watches on my left wrist and wasn’t sure how I’d like the crown on the opposite side. However, those hesitations quickly disappeared after strapping it on, and I appreciated the crown not digging into the back of my hand. Plus, it’s a great conversation starter, with the uninitiated often asking why I’m wearing my watch upside down. Looks-wise … it’s a tool watch. It’s undeniable the LHD was made for a purpose. But that doesn’t mean that it looks out of place on dry land. 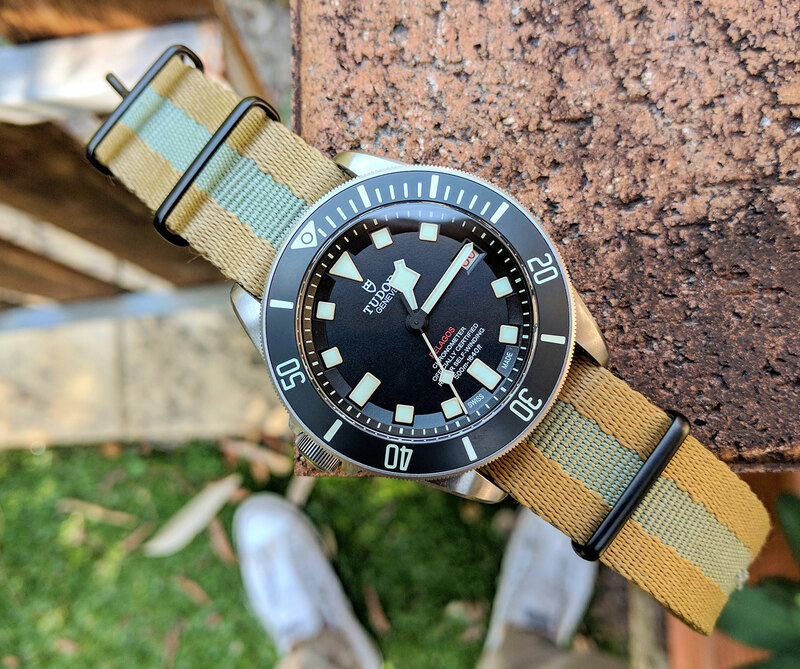 In fact, I’ve found that just by changing straps (which I do almost daily), the look of the LHD completely transforms – leather straps to dress it up, or fully embrace the tool aesthetic and strap it on a NATO. What stood out to me was … the red writing on the dial and every other day on the roulette-style date wheel. I wanted a watch that could be worn everyday with any colour outfit but also one that would add something to the outfit with a pop of colour. It’s amazing how that one little line of red text creates some excitement and adds interest to the otherwise colourless dial. Like a kid waking up on Christmas morning, excited to see what the man in the red suit has brought them, I find myself looking forward to the even-numbered red date days. I’d wear this with … everything. I say everything because most days I’m dressed casual to smart casual. Usually in denim and a T-shirt, or chinos and a shirt. So, for me, the LHD is perfect for everyday wear (especially when I change the straps to match my outfit). I don’t wear suits often, but personally I love the rugged look of a diver with tie and jacket. If I could change anything … I would drill some lug holes. Did I mention I like to change straps on the LHD? Removing the bracelet and changing straps is a seriously huge pain, unless you have a pair of spring bar pliers – and even then it’s difficult. Six months on … I’m still as happy today as I was when I first opened the box. The LHD is my perfect everyday watch and I find myself reaching for it every morning. I don’t have to worry about getting it wet or knocking it around a bit and I know that most days when I pick it up it will be ticking away and the time will be accurate.